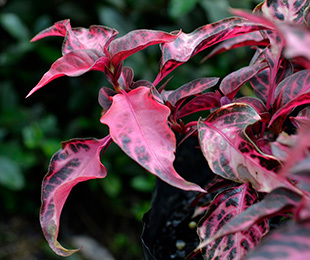 Description: Party Pink™ Alternanthera provides great colour contrast amongst other plants. This plant loves humidity and is heat tolerant. It is a frost tender shrub, so it will need to be planted in a sheltered position to protect it from light frost. 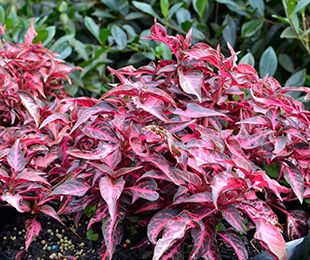 In frost free areas, Party Pink™ Alternanthera can be planted in full sun to part shade. Size: Approximately 40-50cm x 40-50cm. Uses: Specimen planting in garden beds, containers, patio pots. Position: Full sun to part shade. Party Pink™ Alternanthera loves humidity and is heat tolerant. It’s a frost tender shrub, so it will need to be planted in a sheltered position to protect it from light frost. In frost-free areas Party Pink™ Alternanthera can be planted in full sun to part shade. It requires well drained moist soils. Care: Water as required for 8-13 weeks until established. Plant in a well mulched garden (chunky mulch is recommended). If required use slow release fertiliser in spring. Yearly pruning will promote vibrant new growth. Provide the Party Pink™ plant with adequate water as required. Keep moist in dry weather and protect from light frost. Where it works: Frost free areas including QLD, Coastal NSW, Coastal WA, Coastal VIC, Coastal SA, and NT.